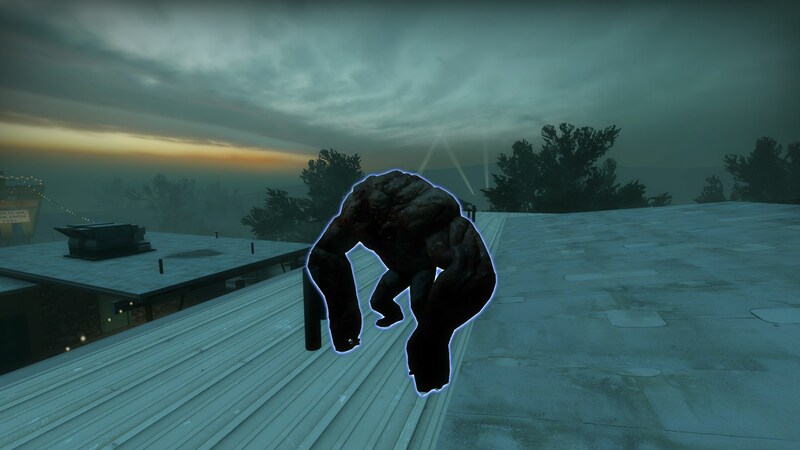 Left 4 Dead 3 / What happened to Left 4 Dead 3? I'm currently working on a Dark Carnival remake campaign, and as I was going through the files, I noticed a lot of beta models and voice lines left in the game. I speculated on what they were for for a while, but eventually decided to just get in contact with Valve themselves to find out what they were for so I could possibly restore them for my campaign. To my surprise they responded to me with huge detailed summaries! I got their permission to post this information, so I'll sum it up here (anonymized). 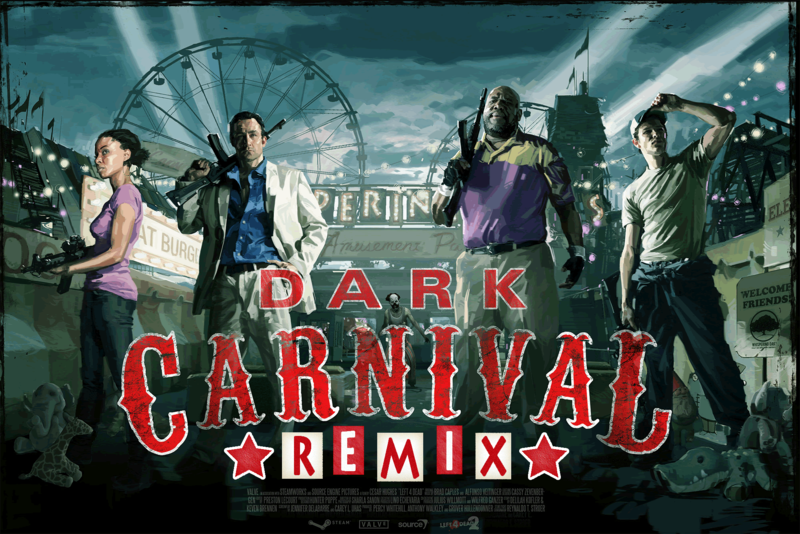 Q: Was Dark Carnival inspired by any real life locations? The rollercoaster was inspired by Colossus at Six Flags Magic Mountain. 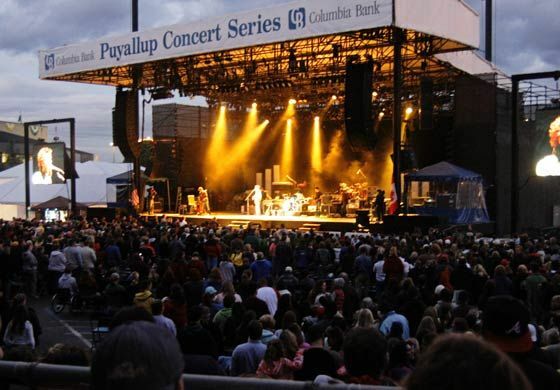 The stage was inspired by Puyallup Fairgrounds, WA. Q: In the files I found models for a monorail (different from the one in the game) and voice lines where Coach and Nick talk about jumping on it. What was the original plan for this? The "monorail" wasn't really a monorail but more like the People Mover in Disneyworld. I think Monorail would have been too permanent a structure so you can see an elevated ride in kiddieland that was more what we had in mind. I think the original thought was you would go up and run along that track to jump over a fence, but I changed it to the rooftops and down the slide because we were going to have you on a track of the roller coaster later. Q: Similarly, I read some more about how the finale was to be set on a train, akin to a more county fair type setting. I also found some voice lines where Nick is arguing with a "hippie". Do you remember anything about this? The original finale was supposed to be a train (you can see you arrive in a train boxcar at the beginning of Swamp Fever) but I think we felt it didn't feel like it really tied into the carnival type setting and <Valve Dev 2> wanted to do the concert. If I remember correctly, there was supposed to be a guy in the concert area who was going to help you with the stage lights and sound. He was going to be up the audience area at the back and you'd have to ask him to be your tech crew. It was later changed to turn it on yourselves. I think this was the "hippie" in the script. The stage finale originally had you move about the stadium to switch banks in the bleachers but we cut it back to just defending the stage. I wanted to keep the players moving rather than sticking to the stage. I eventually pulled this off by placing items around the arena. This might have been when the tech guy was written in but I’m not sure. The train departure was cut in favor the of the helicopter rescue from the stadium. As far as I can remember, the train rescue was going to involve a train showing up behind a fence and the team jumping on when it arrived. It was tougher spatially to pull this off from the stage because we wanted to keep the experience more contained. Much easier to make a chopper fly in over the walls that kept you inside the stadium. Q: Did Valve have any plans to do anything more with the Midnight Riders? 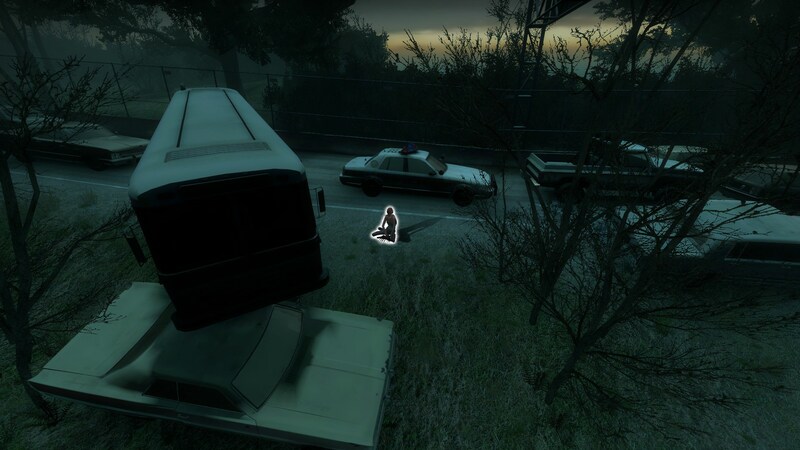 We had a little bit of the Midnight Riders in the DLC where you see a bus driving down the street and it's their tour van. We had planned that they escaped the infection and maybe were going to use them in a DLC at some point where you play as them. This never came to fruition however. There you have it! Thanks again to Valve for such an in-depth response! Going to try to incorporate these elements into my new map if I can. Left 4 Dead 3 / Valve asking interviewees to "Design a scoring system for the next Left 4 Dead"
Ever wonder why it seems like your team got more common than the enemy team? Well, it's possible you did. Some of the events in the game, especially the ones on Dark Carnival, have rng elements in them that should be removed in whatever config is being played now. I checked and I don't think any current config fixes these. Here's an example of Dark Carnival 4, the second half of the event after the gate opens. // This turns off tanks and witches. Whenever you see a "Min" and "Max", that means the game is randomly choosing a value inbetween those two. There's also the "IntensityRelaxThreshold". I haven't tested this for certain but I'm pretty sure it means when the team's "intensity" level gets too high, i.e. youre getting rekt, the game pauses or reduces the rate of common spawning to give you a chance to regroup. In this map it pauses between a value of 1 and 5 (seconds? idk), and a map flow distance of 50. This should be tested first, but you can fix these things by removing all the "relax" lines, and making the "min" and "max" lines have the same value, probably a value in the middle of those two for the best balance. Then use stripper:source to modify the entity that calls the script, usually a func_button entity, edit the logic output that calls Valve's vscript and replace it with the fixed version. Let's try to get as many L4D players under one roof as possible instead of being spread across 10 different groups. Building off of this topic, here's a list of what I think are the best custom campaigns available in L4D2. Keep in mind not all of these have been fully tested to be working with the latest promod, so they may or may not work, test at your own risk. 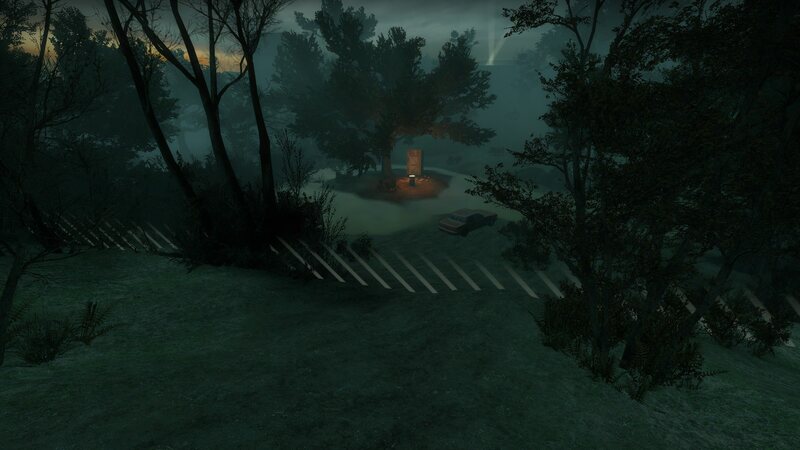 I've also listed some maps that can potentially be really good but have a few flaws in them that could be fixed with either stripper or a remake of the map in Hammer, and what the problem is. Keep in mind some of these maps I only played once and made a quick judgement of (I didn't have the time/motivation to play them multiple times) so the list might not be 100% perfect. And of course, this is all my own opinion and I'm sure others disagree. I've also listed the amount of maps the campaign has in brackets. Dunno why anyone might need this, but here you go. Over the past year me and my friends have been going through and playing every single campaign in existence (that we know of) and I kept track with this list. I used multiple different websites to find these maps. Enjoy. Anyone else see that embarrassment? "Melee weapons generally don't have any benefits"
Did I mention this was on easy mode? Really good and informative guide on melee weapons. I learned a few things I didn't know before, and confirmed a few things I suspected but couldn't prove. The guide makes a good case for the CS knife being incredibly overpowered, possibly warranting the removal from promod (though some servers still force it which is pretty dumb as melee weapons are already really good). I was surprised to learn that all melees have the same range; I figured weapons like the frying pan and tonfa had a very short range, but I suppose this was confirmation bias.